One of the better features of Samsung’s TouchWiz is the ability to house regularly accessed apps in a sidebar that recesses at the side of the screen at the touch of a button. Samsung also allow multiple windows to be stacked allowing two different apps to be viewed or worked on at the same time. 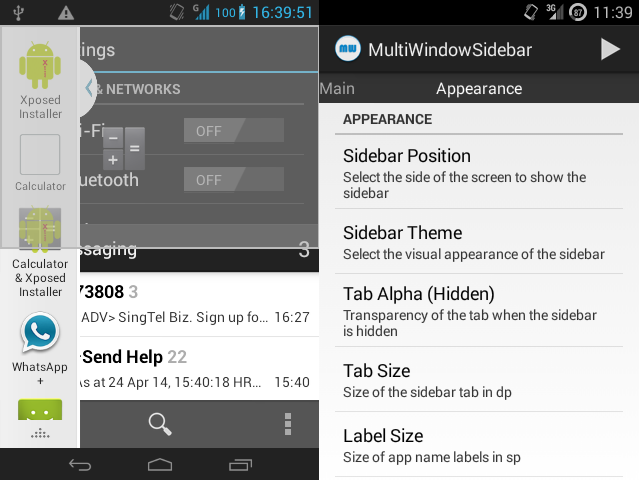 The guys over at XDA have created an APK that mimics the Samsung MultiWindow and Sidebar and it supports all devices running Android 4.0 and above. The split view has been made to compliment XMultiWindow & XHaloFloatingWindow Xposed Modules, so it is recommended to install those also. To Launch Apps, there are 2 modes. You can customize what apps (PA Halo, XHaloFloatingWindow, XMultiWindow or Normally) to open when tapping or dragging.